Iron status was estimated in 463 heterozygous beta-thalassemics to delineate the effect of iron deficiency on the expression of hemoglobin A2 (HbA2) in these patients. One hundred and twenty-six (27.2%) patients with the trait were iron deficient. These iron-deficient patients had a significantly (p<0.0002) higher prevalence of anemia (90.5%) compared with iron-replete patients with the trait (71.5%). 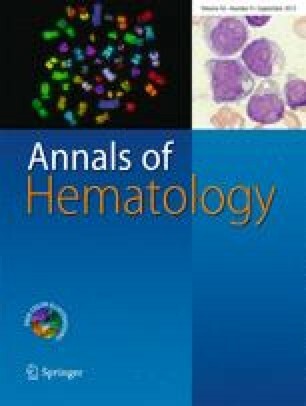 The mean hemoglobin (Hb) concentration, MCV, and MCH were significantly (p<0.0001) lower in patients with beta-thalassemia traits (BTT) who had iron deficiency than in those without iron deficiency. Mean RBC count and MCHC did not differ in the two groups. Mean HbA2 was not significantly different in the two groups of patients with the trait and was elevated ( 1 3.5%) in all but one heterozygote investigated. Mean HbA2/cell was significantly (p<0.05) lower in BTT patients with iron deficiency than in patients without iron deficiency. The presence of iron deficiency did not preclude the detection of BTT in this population. The effect of iron deficiency in BTT was apparent as a significant lowering of the Hb concentration and an increased prevalence of anemia. Iron therapy is warranted for BTT patients with iron-deficiency traits and would help to significantly raise their Hb concentration. The elevation ofHbA2 was striking and could be used with reliability in making the diagnosis of BTT even in the presence of iron deficiency.